Do I have to cut wires? We have plug and play kits for many bikes that don’t require you to cut a single wire, if your bike is not listed on our website for plug and play give us a call and we still be able to do a plug and play kit for you. If we are unable to do a plug and play kit for you, it is still possible for you to go keyless and only requires cutting a few wires. How difficult is the install? The install is very straight forward, i. If we do not have a plug and play system for your bike it is only considered a two beer install. If we do have a plug and play kit for your bike, you may finish the install before your first beer. My bikes ignition wire colors don’t match the wires in the manual, what do I do? If your bikes ignition wires don’t match the wire colors we mention in the manual its pretty easy to figure out which wires go where, you will need to have a multi-meter or test light as well as a something to write with as well as your bikes key. STEP 1 make sure your bikes keyswitch is in the OFF position, now using your Multi-meter or test light we are going to test your bikes wires, write down the color of wires that currently have 12V with the key switch turned off, you may only have one that is at 12V or you may have numerous. STEP 2 (if your bikes keyswitch only has an ON and OFF position skip this step) turn your key to the first position, now test the wires and write down the colors of the wires that now have 12V. STEP 3 Turn your keyswitch to the ON position, now test the wires and write down which now have 12V. STEP 4 if you only had 1 wire that had 12V during STEP 1, hook up our BROWN and our RED wire to this wire. If you have 2 wires that were at 12V during STEP 1, hook our RED wire up to one of them and our BROWN wire up to the other. STEP 5 (if your bikes keyswitch only has an ON and OFF position skip this step) The wires that went to 12V during STEP 2 will go our our RED/WHITE stripe wire. STEP 6 The wires that got 12V during STEP 3 will go to our RED/BLACK stripe wire. Does the bike shut off when I walk away with the Dawg Tag? No, the module only needs to see the key fob for authorization to start not to keep running; we designed the system this way as a safety precaution in case the key fob fell out of your pocket while riding down the freeway or the batteries died while you were mid ride. Do the bikes lights come on when I approach the bike with a valid dawg tag? No, the way the DGD-KIM system works is like this; as you approach your bike, the system begins communication to see if you have a valid Dawg tag with you. If you have a valid tag the system “pre-authorizes” your ignition and accessory circuits, but doesn’t turn anything on. When you flip your stop/run switch to “on” the DGD-KIM sequentially turns on your lights, other Accessories and your ignition on. Do I have to program the Dawg Tags? No the tags that were shipped with the system have been pre-programmed to it. What if I want to run the accessories on the bike but still have the bike be protected? You can add our optional accessory switch which enables you to turn on your ACC circuit independent from your ignition system as well as the key fob, this is a great option if you are at a show or even just a BBQ and you won’t be at your bike the whole time but want to run lighting or the radio. Your bike will still be protected from someone attempting to hop on and ride because you will not be there with the key fob. What if I lose a dawg tag? Simply give us a call at 877-246-5395 and order another one and it will be shipped out promptly. If you are out of town we can always get your bike started right over the phone or even overnight ship your new key fob to you. The KIM is a fully sealed unit; we classify the module as “water resistant”. The system has been tested to operate correctly after being completely submerged underwater for over 5 minutes. The bike has power regardless of whether or not the stop/run switch is on or off. This is indicative of the stop run switch not being hooked up correctly, please ensure that you are on the two stop run switch wires, Either the wires are reversed or you are on the wrong side of the connection. To ensure that you are on the stop run switch wires, take a multi-meter and check for continuity, the two wires should have continuity with the switch turned on and they should not have continuity with the switch turned off. If this is not the case you have no located the stop run switch wires. The bike will power up/ energize but will not crank or turn over. 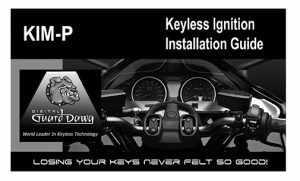 Our Keyless Ignition system must see 10Volts to operate, you will need to check your bikes battery, it is very likely that it is dropping below 10Volts during cranking and this is causing our unit to not allow the bike to start. All Key fobs are sent in Manual mode, this requires you to press the button on the Dawg tag to allow you bike to start. If you ignore the indicators of a low battery; blinking LED, Decrease in range, the key fob has one more Barrier to prevent you from being stranded. If you ignore the warning signs of a low battery the key fob will kick itself out of Automatic mode and put itself back into manual mode as a way to preserve any power it may have left. You will need to press the black button on your key fob in order to get the bike to start. ** Warning** DO NOT relay on this as your indicator of needing to change your batteries. What are the black paired wires for? This is to add in our accessory switch, the accessory switch allows you to turn on your accessory circuit independently from the RFID and ignition circuits. The system worked great not my _________ stopped working what’s going on ? The way our system works is by controlling your bikes ignition and accessory circuits, it’s almost impossible for us to be the cause of one thing not working. In the event you suspect we are the reason for your headlight, blinker, radio, starter, or any other one specific thing not working you can always check our main wiring harness. With the bike authorized (stop/run switch on and a fob nearby) check our red wire for 12V, then make sure our red with black stripe has 12V, then check our brown wire, whatever voltage is on the brown should be coming out the red wire with white stripe. As long as this is happening it is not our unit causing ____blank ____ not to work. At this point you will want to look further down line and see if it’s a bad relay, ballast, fuse etc. causing your problem. Where do I mount the KIM Module at? There are many different mounting possibilities and we know there is limited room on certain bikes so we give you 3ft of harnessing and 6ft of ground wire to find the spot that works best for your bike. Common mounting places include; under the seat, in the headlight bucket, in the fairing and under the gas tank. Will your system work with an MSD ignition system? Our system has built in filtering for MSD ignitions, yes our system will work vehicles equipped with MSD ignition systems. Will the vehicle shut off if I walk away from the iTag? No, for safety reasons, once the key fob has authorized the ignition the vehicle will not shut off or re-arm (the System will Re-arm 30 seconds after shutting the system off). IE; if your key fob battery died or a child threw your key fob out the window (we’ve heard it all) the vehicle will still continue to run until you decide to shut the engine down.